Just a few meters far from Islay, there is an small island with just one hotel, one road and one distillery. It is called Jura. Being so near Islay one could think that Diurach would embrace a similar style but nothing is most far from truth. With an style on their own Jura whiskies are more citrusy and spicier than Islay single malts although they have also their small measure of peat. As Jura distillery is going to release really soon a new expresion of their 30 years old whisky: Camas An Staca and they were so nice to send me a sample I decided to retaste the whole range. My previous contact with Jura whiskies was a bit disappointing and after talking with other bloggers about it I came to the conclusion that my miniatures could be corrupted. 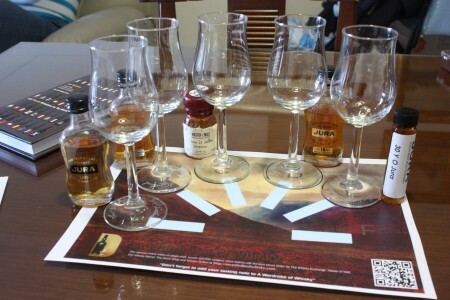 So I ordered a new set of samples, this time from Master of Malt and proceeded to the tasting as it should be. So here is the tasting. A union of two Jura malt whisky styles: one bold, strong and peated, the other warm and delicate. This unique whisky is created from the marriage of traditional Islay style peated barley and a selection of aged malts. Nose (88): more than average. peat, citrus, honey, pepper, vanilla. Better, more like an Islay whisky. I like. Palate (89): powerful, oily. peat, wood, honey, citrus, earth. Almost great! Finish (89): longer than average. cocoa, honey. So based on other whiskies I have already tasted I rate this Isle of Jura Superstition with 89 points over 100. 70cl / 46% / Distillery Bottling - Isle of Jura's 'profoundly peated' Prophecy bottlings are released in small batches and are drier, stronger and smokier than the standard Superstition peated IOJ. Nose (89): more than average. honey, citrus, floral, vanilla. Superior! Palate (90): powerful, oily. honey, wood, peat, spices, vanilla, coffee. So based on other whiskies I have already tasted I rate this Isle of Jura Prophecy / Peated Island Single Malt Scotch Whisky with 89 points over 100. A terrifying 30 year old whisky from Jura. The name 'Camas an Staca' translates to be simply 'Standing Stone' and refers to one of the 8 ancient stones dotted about the island of Jura. The whisky has been matured in American oak for 27 years before being finishing in Gonzalez Byass Oloroso butts for 3 years before bottling at 44% ABV. This whisky is quite an experience in itself. Nose (90): more than average. floral, honey, nuts, pepper, citrus. Palate (91): powerful, oily. honey, nuts, wood, tobacco, vanilla, cocoa, citrus. Finish (90): longer than average. nuts, cocoa. So based on other whiskies I have already tasted I rate this Isle of Jura 30 Year Old with 90 points over 100. From being disappointed to be really impressed. Really the big BIG huge surprise of this tasting has been the Jura 16 years old. Delicious and not so far from the fantastic Jura 30 years old Camas an Staca. If you like sherried whiskies these two are a pair you shouldn’t miss. Tasted any Jura whiskies? Which one is your favorite?